The Clean Team go to Market! Yesterday four committee members (L-R Janet Chisholm, Bernice Walmsley, Polly Chalk and Hilary Jones) engaged with the public – finding out if they have specific areas of concern about litter in Middlewich and encouraging them to join Middlewich Clean Team. Everyone was so positive about our work and we signed two new members. What came out of this event was that many more people in our town are doing their own little bit keeping an area around their home tidy regardless of if they are members or not. Janet said, "'We all felt that the two hours was well spent and it has raised the profile of MCT again in the town". 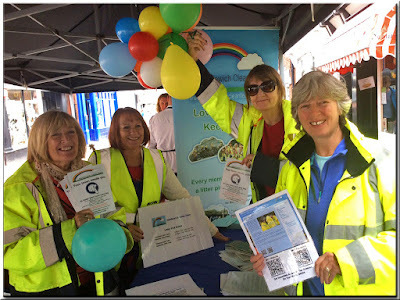 Bernice added, "It was a lovely positive way to spend a couple of hours at the Makers Market, chatting with residents and also with lots of people who came to Middlewich just for the market and were impressed with our friendly town". I would like to take this opportunity to invite you to the Annual Community Planting in St Michael's Church Yard on Tuesday 2nd June. We will meet at 6pm and everyone is welcome to come along and help to make our town a prettier place for the Summer. The Clean Team will provide the Geraniums, but please bring a trowel if you have one. Just a quick reminder that our next litter pick will be next Monday 18th May, meeting at 2pm at Town Bridge Car Park. Don't forget – you can always bring a friend – the more the merrier! Just a quick reminder that our next litter pick will be next Saturday 9th May, meeting at 2pm at the Kings Lock Car Park. Don't forget – you can always bring a friend – the more the merrier! During a recent meeting with a Streetscape officer, we were reminded that dog poo can be put in any of the Council's litter bins, so no need to search for a dog bin. Finally, here's a useful link if you need to report fly tipping or an overflowing bin in our town.